Which games work with Fling mini? There are hundreds of compatible RPG, Space Shooter, Dual-Stick Shooter, Jump 'n' Run, Beat'm Up, and FPS titles! 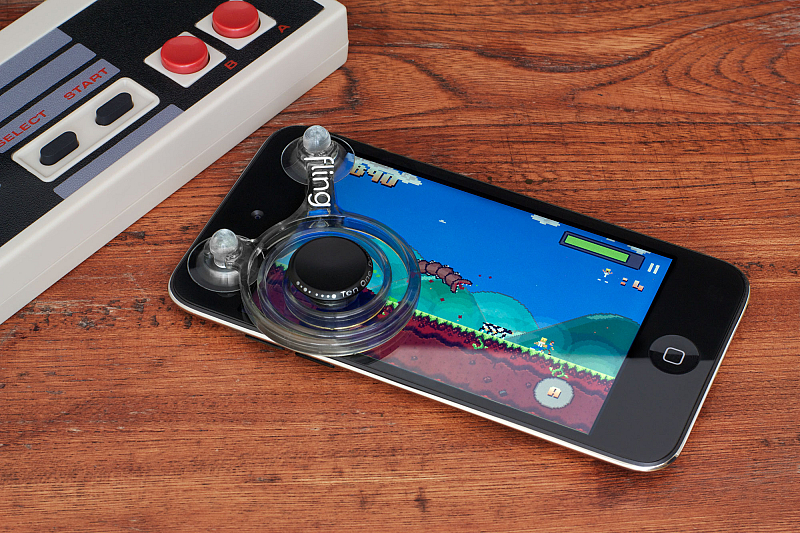 Fling mini can be used with any iPhone or Android game featuring a directional pad, or virtual joystick. Go here for a list of our favorites. How do I use Fling mini? Launch your game of choice. 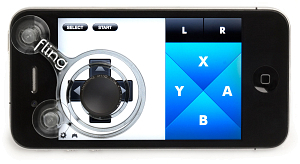 Position Fling mini's center control over the directional pad in the game (usually found in the bottom left corner of the screen). 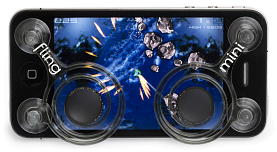 We've included two controllers, in case your game has dual controls. Press down on the suction cups to secure Fling mini to your screen. 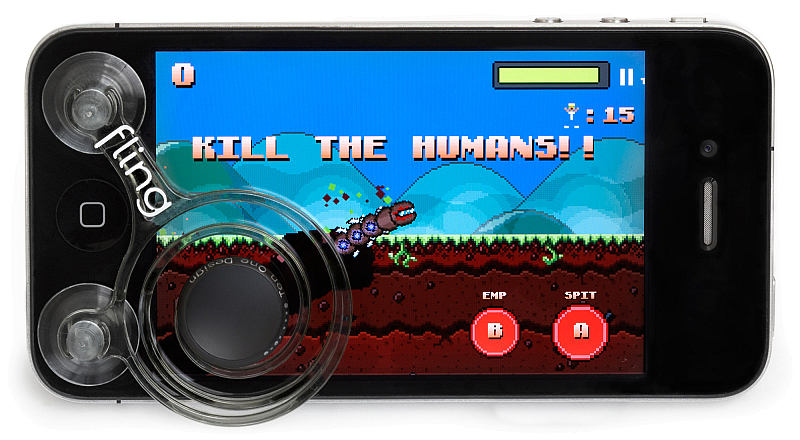 Use your thumb on the thumbstick to navigate easily through the game. 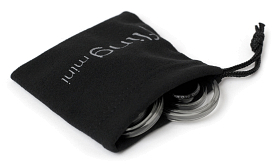 When you're done playing, you can store your Fling minis in the handy drawstring bag. Does it come with one or two joysticks? Fling mini is only sold as a pair for maximum compatibility with all joystick-controlled games. If this is mini, what is Fling? 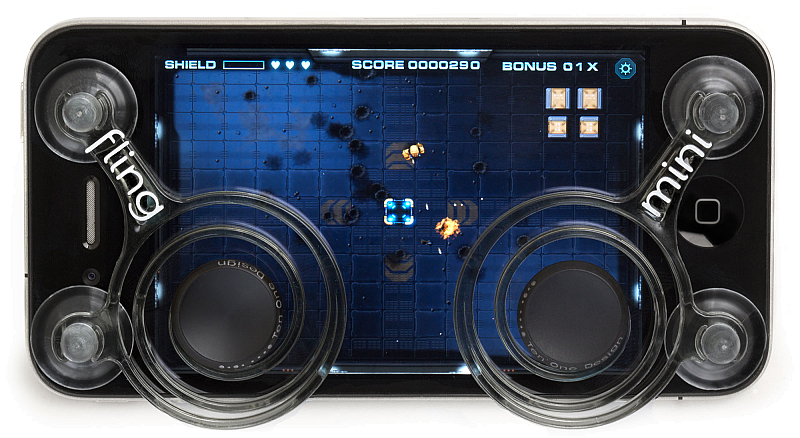 Fling is our iPad-sized joystick. Get a single- or dual-pack here. Will it damage my screen? No. We've done extensive life testing with Fling mini, and can confirm it is 100% safe for your iPhone and iPod touch display. However, (and this may be obvious), do be careful not to allow sand, dust, or other hard grit under your Fling mini. Sand is like kryptonite for iPhones and iPod touches and can scratch your screen if it's trapped under Fling mini while you play, so give it a quick wipe if you find yourself in a saharan desert. How does Fling mini attach to my screen? 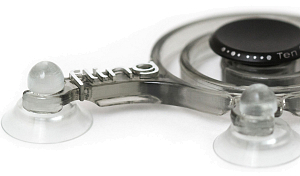 Fling mini stays in place by means of two simple suction cups, which provide a secure grip that is easily removable. Does Fling mini work with iPad? Fling mini is optimized for iPhone-sized joysticks, and it may not have the range for iPad-sized controls. A transparent, flexible engineering resin, machined aluminum, and a couple of suction cups. No. Fling mini is a cool, smoky grey color with white graphic accents. Can I use it with a screen protector? Possibly. We have found that some screen protectors are too sticky, and can keep Fling mini from gliding over the display. If this is your situation, we recommend changing screen protector brands or removing it altogether. Anti-glare screen protectors may keep Fling mini from mounting to the front. Also, over time, you may find that Fling mini can eventually wear a little on some screen protectors. What do I do with Fling mini when I'm not using it? Use the included microfiber bag to stash your Fling minis when you're not gaming or showing them off. You can also use the bag to wipe your screen clean. Is using Fling mini cheating? Certainly not! But you will have an advantage over your opponents. If you want to level the playing field, just tell all your friends to get one, too. If you don't see an answer to your question here, let us know! We've worked hand-in-hand with top iOS gaming devs to bring Fling compatibility to these titles. Fling mini compatible apps have compatibility information in their app description. Do you use an app that's not on this list? Contact the developer today to request Fling support. 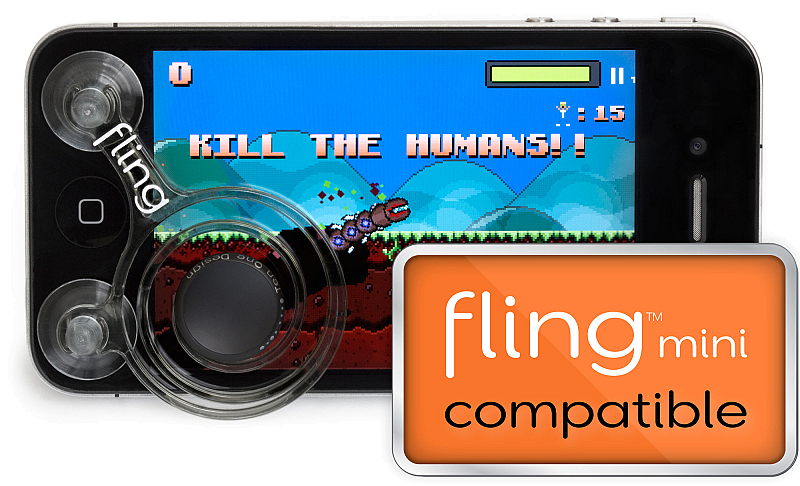 There are hundreds of compatible games you can use with Fling mini. Everything from soccer/football to first person shooters. Fling mini is designed for gaming on the go. It's perfect for those unexpected moments waiting on your train, your lunch, your dad, your class, or your next appointment. Choir boys use this between songs during church. What does Fling mini do that's worth risking salvation? It lets you game faster, longer, and better. You'll eclipse your high scores and puzzle your opponents. 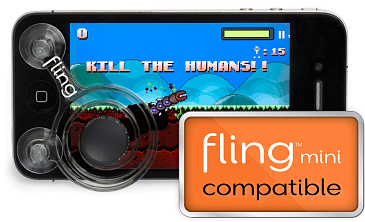 Fling mini's suction cups are perfectly located to maneuver around standard smartphone button locations, so you'll have an easy time locating it over the touchscreen joystick. The mechanical spring is tuned for the perfect amount of resistance. You'll discover a new world of precision control the first time you use Fling mini. Fling mini is constructed from silky-smooth anodized aluminum and an incredibly tough, unusually flexible engineering-grade resin. It's nearly indestructible and will give you years of precision gaming. Besides being made to last, Fling mini was designed from the earliest sketches to visually pop. You know that look your friends get when they see you have something amazing, but they're trying to play it cool? You will soon. 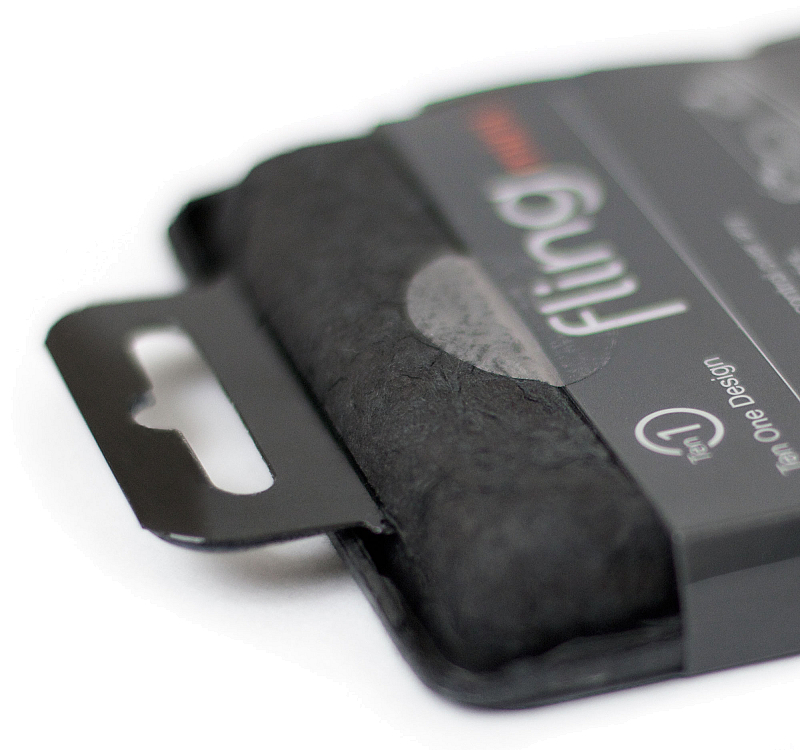 You can attach Fling mini to the back of your smartphone, or use the included fleece bag. Either way, your trusty joysticks stay with you, ready for that unexpected opportunity to start gaming. As with our other products, we've carefully considered our environmental footprint. Fling mini is sold in post-consumer recycled paperboard with an easily recyclable PET sleeve (PET is resin code 1, and is accepted by all recycling programs). The entire package can be recycled. Interestingly, because the paperboard has been previously recycled (maybe even several times) the tired fibers may simply disintegrate during the next recycling process. This is a big win for the environment, because it indicates the material has been used to its full potential. Please join us in our efforts, and be sure to recycle this package. Fling mini is a pair of joysticks for iPhone, iPod touch, or Android devices. 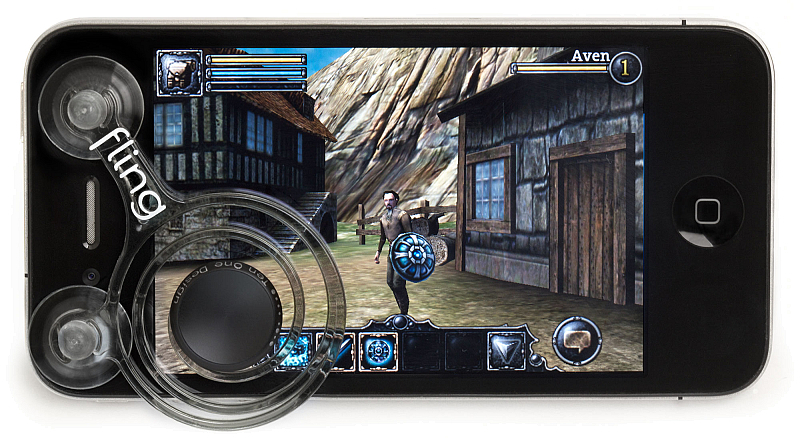 It gives you controls you can touch for any game that has an on-screen joystick. Fling mini's patent pending design gives your games a true analog stick feel. They come as a pair, for maximum compatibility with all games. Many developers have optimized their game for Fling mini, so you won't have any trouble finding Fling mini compatible apps. 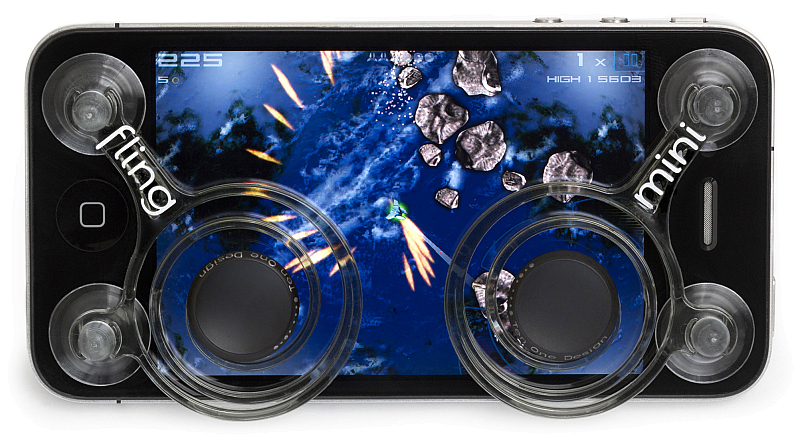 Anything with a virtual joystick on-screen will work. Just head over to the App Store, and keep an eye out for the compatibility badge. There's also a list of our favorites here. 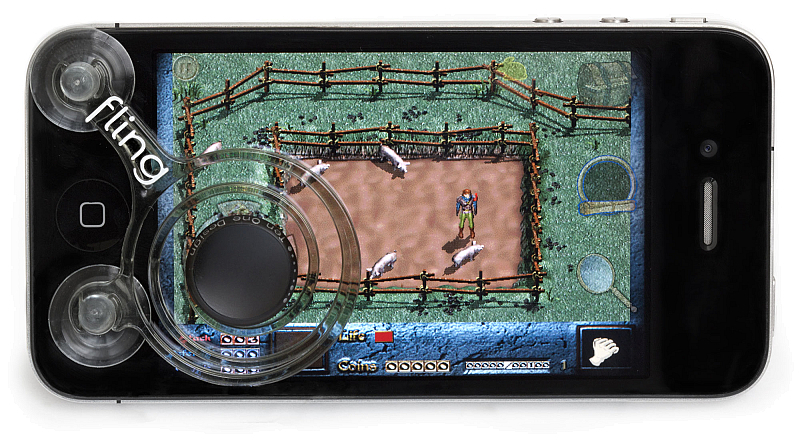 iPhone gaming is all about precision maneuvering, and Fling mini gives you this crucial advantage. 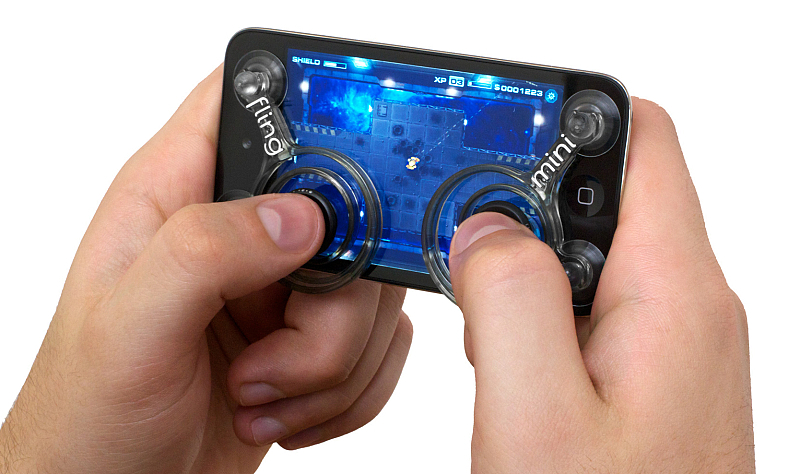 As you control a game with Fling mini, it pushes gently back towards the center position. 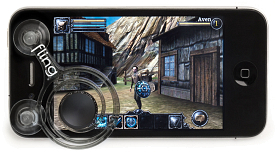 This haptic feedback guides and stabilizes your gameplay, making every action more accurate. Should you tell your friends? Maybe, but definitely don't tell your opponents! Fling is constructed from silky-smooth anodized aluminum, and an incredibly tough, unusually flexible engineering-grade resin. It's nearly indestructible and will give you years of precision gaming. Miss your console? 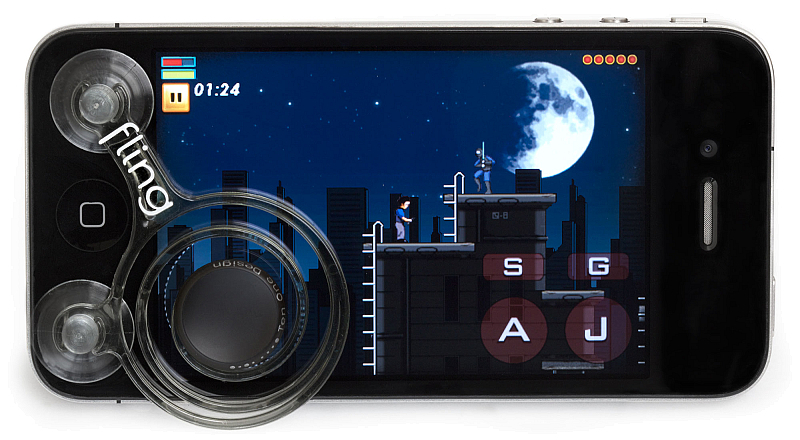 Fling mini gives you the feel of an analog joystick, so your games feel even more immersive. When the screen illuminates, Fling mini melts away and the screen shines through, keeping you on top of all the action. Let us help you find a super-addictive Fling + game combo! 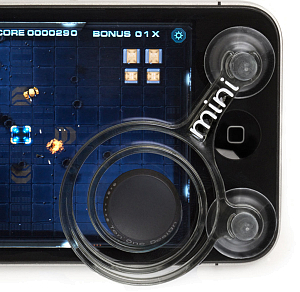 Improve your iPad gaming experience by using Joypad with Fling Mini. The Fling mini fits perfectly on Joypad's d-pad and virtual analog sticks to create a portable game controller. Having a game controller for iPad anywhere I go, check.